This never-before rendering of the Painted Ladies, famous set of Victorian row houses along Steiner Street, was shot from Alamo Square Park. The painting of Victorians with three or more colors to enhance architectural detail, the so-called colorist movement, began in 1960’s. This polychrome urban renewal was as reversal of Victorians being painted with surplus battleship grey following WWI and WWII. 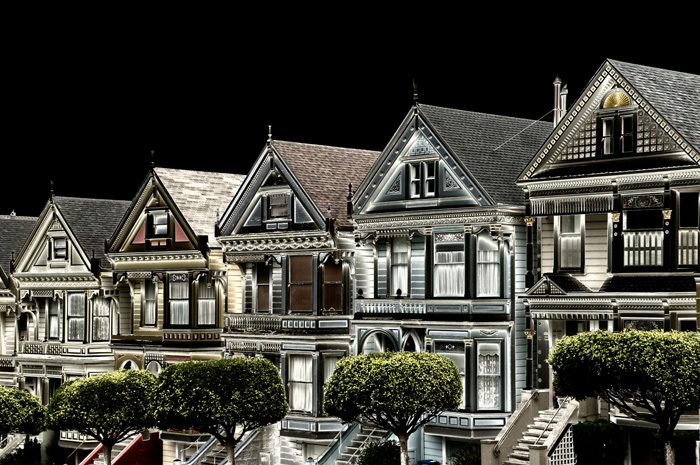 The “after dark” impression of these colorfully restored century old Victorians was created with a century old photographic technique – solarization.